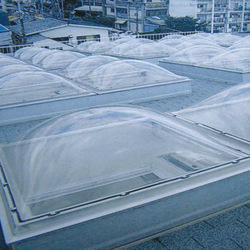 Providing you the best range of polycarbonate skylight dome with effective & timely delivery. At Tilara Polyplast we are dedicated to providing our customers with energy efficient skylights in a wide variety of colors and styles. Our commercial and home daylighting solutions help you save on energy cost for your home or business, while brighting the environment with the plenty of natural light. In addition to providing environmental benefits, our products are designed to improve the aesthetics of any building and add a stunning design element to your home. Our home skylights are available in many styles, which allow our customers to easily find the right skylight for a flat or pitched roof. Tilara Skylight Dome Pyramid are thermoformed from POLYCARBONATE ACRYLIC sheet. We offer a wide range of sizes, shapes and glazing options to meet virtually any specifier and client requirements. Some of the features offered in various Pyramid Dome Skylight designs include UV coating, high impact strength, optical clarity, lightweight, environment-friendly, weather resistant, anti-corrosion, easy-insulation, virtually unbreakable. The Tilara Skylight Dome Pyramid is highly energy-effective construction element for innovative new construction projects, renovation projects and for converting and repairing industrial, commercial retail buildings depending on requirements. Polycarbonate Skylight Dome Pyramid protects any residential, commercial, public or industrial building from sunlight, snow, heavy rain or anytime building need protection. PC Skylgiht Dome light transmits upto 89% light. Comparing with the other materials, after 10 years, the polycarbonate light just loss 6% light transmission. The lighting roofing of Building lobby, Parking lot, Bower and Corridor, Gymnasium plants, Shopping malls, Hotels Restaurants, Stadiums, Hospitals, Entertainment Centers, Workshop, etc.